Click on a screenshot to view it in full size at new window. Press Refresh in your browser to reload the page with different screenshots. 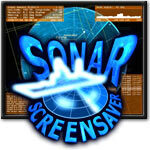 Sonar Screensaver is a flexible and detailed fabulous sonar simulation software. It will turn your PC into a fabulous sonar outpost, watching for the objects at surface and underwater somewhere in coastal zone. If you have two or more monitors connected to your PC, you will be able to configure it to show same or different situations on different displays. This will turn your workplace into something like sci-fi underwater observation post. You also will be able to choose display resolution, color quality for each of your monitors, and choose which of them should be black while the animation is running. Sonar Screensaver has a function which makes it more useful, allowing you to leave an on-screen message while you are away from your computer. You will be able to create several shortcuts on your desktop or quick launch bar for starting the screensaver quickly in different situations (e.g. lunch, briefing or meeting). Click on a screenshot to view it in full size at new window. Radar Screensaver is innovative and visually stunning software that can turn your video display into a fascinating sky-watching radar screen. It ‘detects’ all flying objects, identifies their type, speed and flight course, and simulates movement across the entire airspace within range of the ‘virtual’ antennas. This process is displayed in real time on your screen as if you were sitting in the chair of a real air traffic controller. If you have two or more monitors connected to your PC, it is possible to configure the screensaver to show either the same or different scenarios and displays. This can transform your workplace into something akin to a real airspace observation post. You can also select the display resolution and color quality of each monitor. Radar Screensaver also has a special feature that gives it an edge over most other screensavers. It allows you to leave an on-screen message while you are away from your desk. For time saving, it is possible to create several shortcuts on your desktop or the quick launch bar for quickly launching the screensaver in different situations (e.g. lunch, briefing or a meeting). Flaredance Firework Screensaver is flexible, detailed and hyper-realistic fireworks simulation software. It will operate as screensaver and will give you plenty of hours of interesting and attractive animation. Depicted mathematic model simulates fireworks rocket explosions in most of the physical aspects, such as gravity, glows and halos, winds, air resistance, smokes, clouds and sounds. The most exciting and unique feature is a special camera mode that gives you ability to see the fireworks through the camera flying between explosions, thousands of sparkles and clouds of glowing smokes lighted by blasts and flares. You will also notice camera shakes from near explosions and delays from distanced. Another useful feature makes Flaredance Firework Screensaver not only pretty screen saving utility. You can use "on-screen-message" to leave a text on a screen when you are away from your PC. Flaredance Firework Screensaver fully supports multi-display computer configurations and wide range of hardware. It can operate in either OpenGL or DirectX mode. This conceptually simple but beautiful and modern animated screensaver will give you a lot of interesting hours and fascinating animation. In the basis of the Gyrodrome Screensaver animation are several rings rotating one inside another around all the three world axes relatively to virtual world and to each other. Its background might not only be simply colored. Place one of five spherical panoramas included into the Gyrodrome Screensaver installation package. Gyrodrome Screensaver has many settings and you will be able to configure most of them! These parameters include background, camera position and movement, lights, rings geometry, material properties, reflectivity and rotation. Almost all parameters are randomizable – just set a degree of randomness and you will get a different animation on each run! Stars 3 Screensaver is an impressive and sophisticated replacement for the simple, 16-bit "Starfield" screensaver which comes with Windows™. It is beautiful and entertaining. You will be able to configure it many ways to provide you many hours of enjoyment. As with other screen savers, when your computer is idle for some time, Stars 3 Screensaver will show a simulation of the space flight. Brightness of each star depends as on its own stellar characteristics as well as on distance from the viewpoint. Flight rotation capability gives a dramatic, realistic and fantastic animation. The more futuristic view may be achieved with interstellar gas clouds simulation. Non-linear flight direction. It is possible to configure this screensaver so that flight will not be straight, because course of the starship will be changing smoothly. Amount of roaming and frequency of course changes are adjustable, and can be set in wide range of values. Realism. Star size does not change during approaching to it. It is real, because angular size of star is very small and becomes visible on extremely close distances, like our Sun, for example. In addition, it can play an audio file during operation. We have included one popular sound, which is well known from science fiction movies about space voyages, travels, star wars, etc.